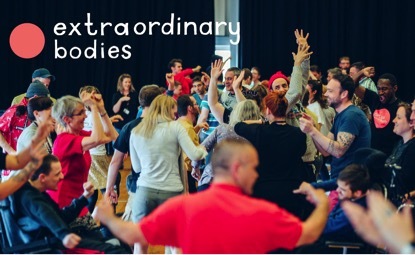 We are offering a unique and exciting opportunity to perform with award-winning circus company, Extraordinary Bodies, at National Theatre London. Everybody is welcome! Move, dance and perform with us as part of our groundbreaking and fully accessible new show What Am I Worth? You will learn a floor-based movement sequence and create your own celebration scene alongside a diverse range of people. No performance experience necessary. We are looking for quick learners with good listening skills and stamina of the mind and soul. Conventional physical fitness not required. Participants will be required all day for rehearsals and performances. Everyone will perform together once on Friday 10th August and twice on Saturday 11th August. Extraordinary Bodies is the UK’s leading, professional, integrated circus company. They create bold, radical and joyous performance which increases national awareness of the integration of D/deaf, disabled and non-disabled artists working equally together. They make work with, for and about our communities; work that represents the diverse makeup of our society, onstage, offstage and in the audience.